The management appreciates the co-operations and assistance extended by state government in securing all the permissions and approvals required for the project and expects this project to be the benchmark for the State of Maharashtra from the Tourism Point of view. The proposed Rope-Way would provide direct connectivity from base station which is to be located at Bhutivali, near Bhivpuri to Matheran. The total length of proposed ropeway will be 4.7 kilometers approx, which will be one of the longest in India. The vertical rise of Rope-way would be 750 meters from bottom station level. The Rope-Way is being designed to have capacity to carry 500 – 600 passengers every hour. The base station at Bhutivali is approximately 1 ½ to 2 hour journey (approx 80 km) from the city of Mumbai. The upper station would be located at Madhavji Point (Lord Garden) which is in the heart of the Matheran. The said Rope-way would be divided into two sections which would allow tourists to enjoy two types of cable cars at one place. The 1st section will be having continuous running Mono Cable Gandola's for a length of 2900 meter approx. and 2nd section will have Reversible Jig back ropeway for about 1700 meter. It is worth noting that this kind of Rope-Way consisting of two types of cable cars is being installed first time in India. The approximately journey time from base station at Bhutavali to Matheran hill station using ropeway is expected to be completed within 20 minutes approx. The present travel time to Matheran from Mumbai takes around 3 ½ to 5 hours depending upon the mode of transport chosen. This would be reduced considerably to approx 2 to 2 ½ hours from Mumbai after execution of the said project. 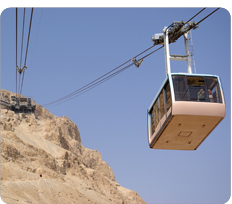 Keeping the safety as uppermost in their mind, the company has shortlisted few suppliers for designing and erecting ropeway who are among the best in the world and have already executed many such similar projections in different parts of the world. The Company also intends to develop base station in 2nd phase to provide lot of tourists attractions in future which includes amusement park, resort, children play area, food court, coffee shop etc. The company expects increase in tourists inflow to Matheran after execution of this project as this provides easy accessibility to Matheran Hill Station. It will be helpful to generate employment opportunities to the local people of Matheran throughout the year which are otherwise dependent upon seasonal time which is barely few months in a year. This is expected to be one of the hot tourist’s destinations for the State of Maharashtra and especially for the city of Mumbai and Pune due to its convenient location. Ropeway is the only way to maintain ecology of hill station on long term basis as most of tourists will be diverted to Ropeway who would be parking the vehicles at the base station – Bhutivali reducing vehicular traffic to Matheran Hills substantially.